Your Price: $159.99 - Call for Discounts and Customization! When it comes to running an efficient business, every moment counts. A lost connection is lost time and lost money. Stop waiting for stalled signals. Signal 3G is ready to integrate with LTE modems and is specifically developed for M2M installations—delivering a strong, reliable signal for cellular modems for successful data transfer and cloud migration. Signal 3G improves transmissions speeds while reducing resending of data, ensuring that your company can efficiently transmit, receive and store data across multiple platforms. Best of all, the weBoost Signal 3G is configurable to fit virtually any M2M installation. 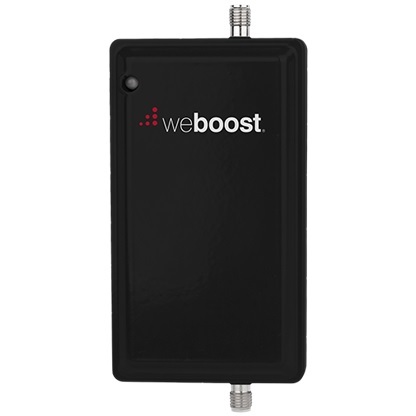 The 800MHz and 1900MHz cellular signal from the cell site is received by the Cellular antenna (sold separately). The signal is then amplified and transmitted to your M2M device through the SMA female output on the device that is paired to a specific adapter available from wpsantennas.com. When the device transmits, the signal is sent to the amplifier through the adapter and then amplified and sent to the cell site through the outside antenna. Allows you to connect FME/Male to SMA/Female.